I couldn’t make FIBFest, it is true… but I sent some flies to Pete over at Fishing Jones so at least my flies could make it there and hopefully end up in the jaw of an Androsian bonefish or two. 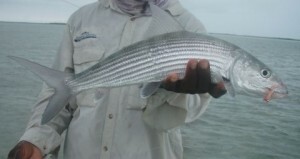 That’s one of my ties in that South Andros bonefish, caught by Pete today as he fished with Michael Gracie out of Andros South. This entry was posted on Wednesday, May 19th, 2010 at 1:25 pm	and is filed under Locations. You can follow any comments to this entry through the RSS 2.0 feed. You can leave a comment, or trackback from your own site. We’re thinking about you a lot this week Bjorn! Hey Andrew, I’m enjoying seeing the posts and photos. It turned out we closed on the house this week. I needed to sign paper work, move the last of our stuff out of the house and I also came down with a cold… so, while I’d LOVE to have been there, probably a good thing I wasn’t.